In the second round we faced team from Poznań with players that I knew very well. 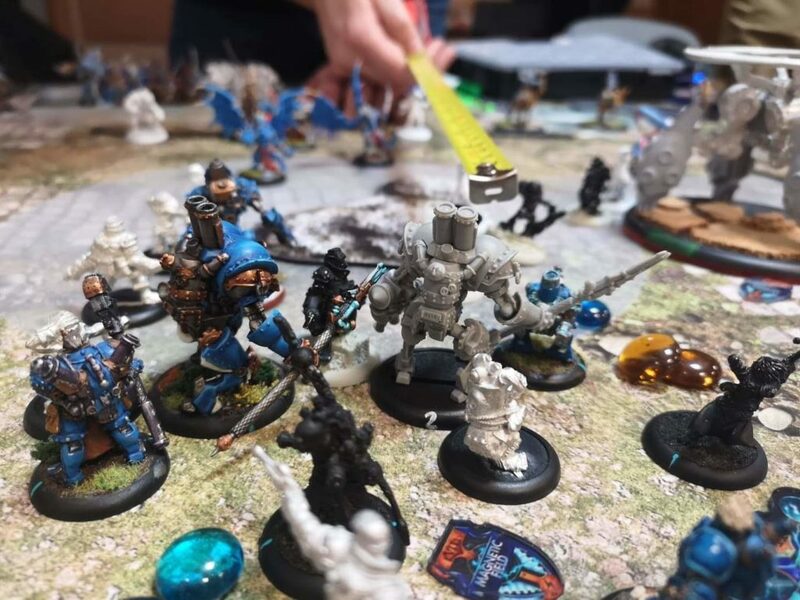 Again, we got pairings we wanted and I was to play against Maciej Matlak, known from Krychu’s Trollbloods battle reports, like here (as they are both living in Poznań). Mateusz was playing against Semir and his Cryx (Thexus vs. Goreshade1) and Tomasz against Filip and his Trollbloods (Ashlynn vs. Kolgrima). Maciej had Kallus1 and Kallus2 in his lists. Right away I knew I will play with the old man again, Maciej decided to take Kallus1 in Ravens. I played Legion for a little while 😉 and I knew how this list works, although I never played it myself. Once again, I’d like to apologize, but my phone died after the tournament and all of my photos are gone. There was a huge forest in the middle of the table. In the first rounds we just ran forward. Maciej was already in my threat ranges so I decided to feat and take Archangel out of the equation. Maciej cleverly placed him on the flank, so I woulnd’t kill everything around him with electro leaps. I managed to kill him using left Battle Engine, Thunderhead and Firefly. I killed plenty of models in the middle of the board, triggering few Incubi (e-leaps are not attacks) and killed couple of Raptors that could have range to Nemo. I was still afraid, that Maciej will go for Holy Mary Casterkill so I created Fort Nemo (one of few photos that I have from this tournament). Maciej tried to kill Nemo, but it was impossible. I simply killed Kallus1 and we shook hands. Yet again, we got match ups we wanted and I was able to get a really good pairing for my Nemo3. Electro leaps are not triggering Kallus1 feat, since the damage is not caused by an attack. That, combined with huge amount of those e-leaps, resulted in an undoubtedly one sided game. Nevertheless, Maciej kept his sense of humour and we had lots of fun! Thanks Maciej for the game!